First deliveries to launch customer Aeroflot originally were slated to begin by late 2008. Aeroflot has already removed the Tupolev Tu-134 aircraft from service to make room for the first SSJ’s to arrive which are due to replace the aging mid-sized airplane. “The airplane is currently in the final testing stages and it will make its first flight within a month,” Alexei Fyodorov, CEO of United Aircraft Building Corp., told RIA Novosti. “Our specialists are working round the clock to meet our obligations to contractors.” We can only hope that this “within a month” will now be real, as it is crucial for the SSJ to show a positive image to the World Market, that it plans to conquer. 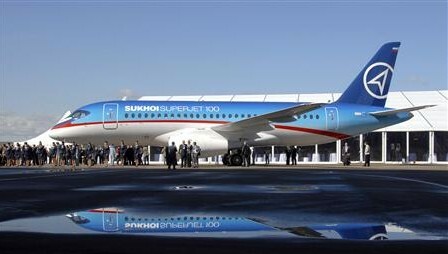 Airbus and Boeing are stronger and larger players to manage such delays, but for Sukhoi being a new entrant, it is very important to show professionalism to its (future) customers. To date, the 78 and 98 seat version aircraft has collected 73 firm orders and 46 options, mostly from Russian customers. It will be interesting to follow the developments of the new Chinese Regional Jet, the Japanese Mitsubishi Regional Jet as well as the new Bombardier C-Ceries – will they be on schedule with their new programs or can we make a new rule: “New Aircraft development projects in the 21st century are always behind schedule”? As AirlineWorld has reported last year, Boeing had earlier announced two test flights with alternative fuel to be conducted together with Air New Zealand sometime through 2008 (later a similar plan was announced in cooperation with Virgin Atlantic) . 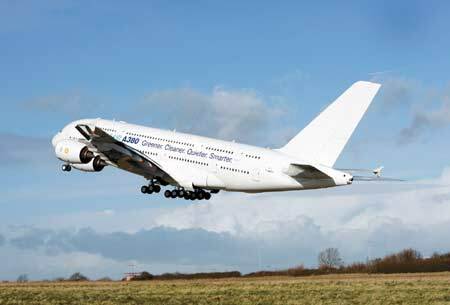 As a slap in the face, Airbus earlier this week announced that they have successfully carried out a similar test one week ago, on Friday, 01FEB2008, becoming the first ever commercial flight using such fuel. As ATW and Airbus have reported, Airbus operated this test flight using a liquid fuel processed from gas on its new, supposedly currently most eco-friendly super-jumbo, the A380 (test aircraft A380 MSN004). The commercial aircraft was partially powered by an alternative fuel. The Gas to Liquids (GTL) test flight between two of Aribus’s operational bases from Filton, UK to Toulouse, France lasted 3 hr. During the flight, engine number one of four Rolls-Royce Trent 900 engines was fed with a blend of GTL and jet fuel while the remaining three consumed regular standard jet fuel. Shell International Petroleum provided the GTL. During the test flight, they have tested maximum throttle, maximum flight altitude, and maximum speed as well. The test, which the manufacturer said was the first of several of its kind that it will conduct, was in accordance with the agreement it signed in November 2007 with the Qatar GTL consortium partners, which include Qatar Airways, Rolls-Royce, Qatar Petroleum, Shell, Qatar Science & Technology Park and Woqod Qatar Fuel Co. “This is the first step of a long-term Airbus testing phase to evaluate viable and sustainable alternative fuels for the future,” the company said. “GTL could be available at certain locations to make it a practical and viable drop-in alternative fuel for commercial aviation in the short term. GTL has attractive characteristics for local air quality, as well as some benefits in terms of aircraft fuel burn relative to existing jet fuel.” GTL is virtually free of sulphur, it noted. Qatar Airways has a target to become the first airline in the world to use such a synthetic fuel in their everyday operations. The official video of the test flight by Airbus can be viewed here. I have bought the ticket through www.airtran.com. The website is very simple, and thus very easy to use, very understandable, clear. It shows you all available fares in a very simple table with all flight details being displayed in small pop-up dialog windows. It is clear which flight is nonstop, and which ones involve a transfer. What is a nice feature that I have not seen before at other airlines’ sites, is that you can have a printer friendly version of the flight search results. So you can print your options and discuss it with somebody or attach it to a business trip plan, etc. Very handy, as mostly you end up with complicated, colorful search results which you can scroll for minutes and may be printed on four pages which then you have to somehow compile to see the actual information. This is a nice added value feature! After selecting your flights you get an overview, that includes the most important fare rules, terms and conditions, check-in information, and the option to add your a+ rewards number (frequent flier program of AirTran) as well to book a trip protection insurance. You also have the option to secure your seat when booking, which is at extra cost, but at an acceptable level I think. I chose 17F for both of my flights for an extra USD 5 for each flight, but could have chosen emergency exit seats with extra leg room for USD 20/flight. You can of course pay by credit card, but you can also use your PayPal account, with BillMeLater or with CheckFree account. In the last step you confirm your payment details and recieve a confirmation mail afterwards. There is no option to offset your carbon emissions on this website. I wasn’t worried about check-in at all, as I had pre-selected my seat, I knew I will have a window seat, still I received a mail 24 hours before the first flight that check-in is now available. I went ahead and checked in, where I could select another seat. (Actually on the way back I did so, as 17F didn’t have enough legroom due to some wiring at the bottom of the previous seat.) Online check-in at the website is also straight forward, and fast. You have other choices to check-in, such as the Bye-Pass Check-in kiosks at the airport, and you can also drop your luggage off at the sidewalk check-in areas at the Atlanta Airport so you don’t even have to carry your luggage in the terminal building, they take it away from your right where the taxi can drop you off. Punctuality: Flight took off 10 minutes late, arrived at about the right time. Boarding: Was very efficient, due to the boarding zones -printed on the boarding card- called one by one. Flight Attendants: There were 3 of them, they were average looking, all of them seemed friendly. 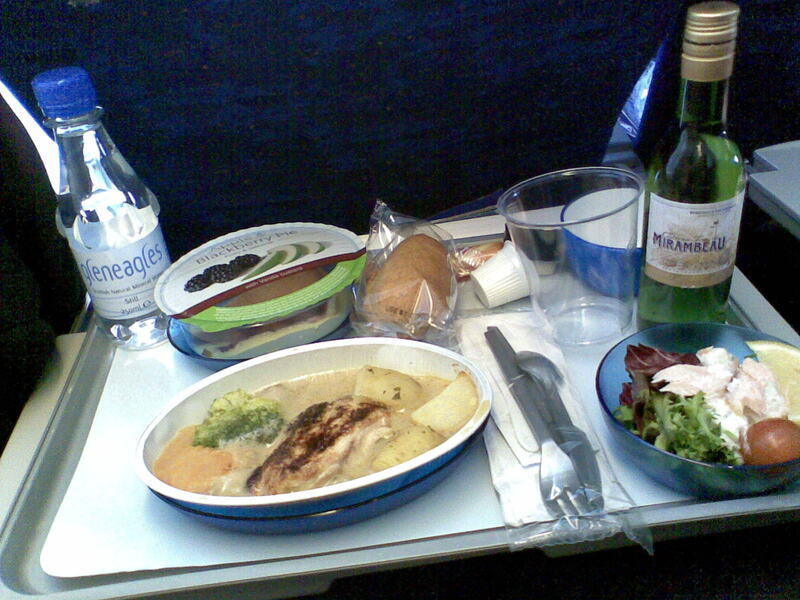 Meals: Everybody is asked if they want snacks (small pack of pretzels) and a glass of soft drink (Coca-Cola products). For USD 5 you can also get beer, wine, shots or mini-cocktails. In business class these are included in the ticket prize for economy, you may pay onboard, or while checking in on the ByePass Kiosks before your flight, which would give you vouchers. Punctuality: Flight took off exactly on time, arrived 10 minutes late. Boarding: Dayton airport was deserted on this Sunday night, no lines to que, just walk-through to the gate. Same zoned boarding used as in Atlanta, due to the low number of people plane was boarded very quickly. Seats: As my seat was on the left side of the plane where you only have two seats, it felt a little bit more comfortable. I had a bigger guy sitting next to me, but as soon as doors were closed, he moved elsewhere, so we were both more comfortable. Flight Attendants: There were 3 of them, average. Meals: Same small pack of pretzels, same soft drinks as on the outbound flight. Entertainment: Free XM satellite radio at every seat. 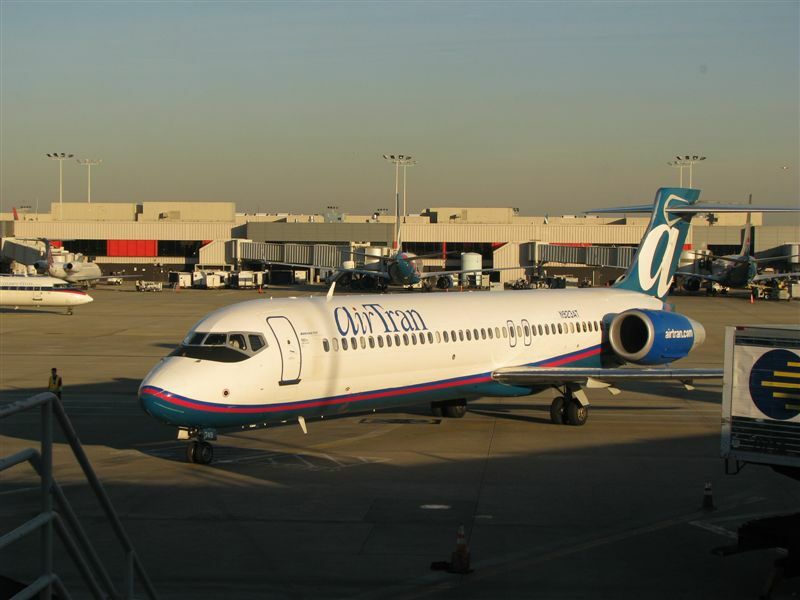 AirTran just does what air travel is basically about: Takes you from point A to point B. Considered as a low-cost, it still offers free drinks on board which is nice, and I also liked the XM satellite radio. Other than that it does nothing more, nothing less. It’s good value for your money with efficient procedures (online booking, online check-in, efficient boarding). I paid USD 248 for my return ticket, and if I will ever visit my American families in Ohio from Atlanta again, I would take this flight once more. Many people around the world thought it’s not fair for the US and the EU to introduce and maintain a list of airlines which they ban from their airspace and classify as “not acceptable” basically in terms of flight safety. Besides saving their airspace from possible accidents, they are trying to protect their citizens by providing them with a list of airlines they believe is not safe to fly. The reason is usually the lack of proper technical maintenance at these airlines. ALL air companies of Indonesia have been on these lists since they were introduced, and many people did not like the idea of putting all aviation companies of a certain country on the list. But the recent events in Indonesian Air Transport show the list is (at least very close to being) right! A Boeing 737-400 operated by Batavia Air – a low cost airline on the Indonesian market since 2002, operating 36 aircraft including Airbus A319 and A320’s besides the older Boeing 737 family versions (-200, -300 and -400) – took from Jakarta Sukarno-Hatta airport, carrying 144 people (138 passengers and 6 crew). Not so long after take-off (about 15 minutes according to some of the news sources) a piece of the wing has simply fallen off the aircraft. Some reports claim it was a 2 m piece, while others are mentioning an “only” 40cm×50cm part. It doesn’t really matter how big it actually was, the fact that a part of the wing just falls off of an airplane carrying passengers is scary enough in my opinion and should not happen! According to some reports, the separated chunk of the wing landed close to the airport, others say it fell on a residential house. The plane was bound to fly to Pontianak on Borneo island before turning around and safely landing at the airport. Nobody onboard was hurt. Fortunately this third relatively bigger incident in Indonesian Aviation this year did not claim any lifes, unlike the two crashes earlier in 2007 by Garuda and Adam Air, where a total of 123 casulties were suffered. We hope there will be no more aviation safety news from Indonesia this year, and that the domestic airlines will start taking air safety seriously following such accidents and incidents! Yesterday evening two planes collided on the runway during preparation for taking off. Nobody was injured, although passengers panicked and about 20 fire engines were called to the scene, which understandably strengthened their bad feelings. The two planes involved were a Boeing 747 operated by British Airways on its way to Singapore and an Airbus A340 heading for the Maldives, operated by Sri Lankan Airlines. 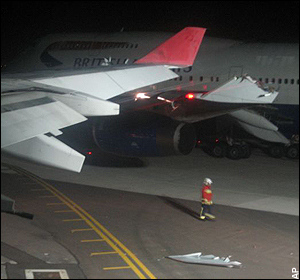 According to witnesses one of the engines of the BA Jumbo fell onto the ground after the other aircraft’s wing hit it. In the picture of AP news agency it is not visible, but it is clear that the 747’s winglet was torn down and cut in half by the Airbus. Passengers were safely evacuated and they were offered compensation. The reasons are not known yet, investigations started and we will hopefully learn about the result very soon. Unfortunately Heathrow is one of the most crowded airports of the world and as AirlineWorld reported it earlier, the new terminal will not be open for passengers earlier than next March. BAA is often criticized for the delays at Heathrow Airport as more than one third of the airlines leave Heathrow more than 15 minutes late. We will give you updates about the investigation as soon as results will be available. Please make sure you add Airline World blog to your favorites and your RSS reader. Boeing has announced that the first delivery of the long-awaited Boeing 787 Dreamliner will be delayed by at least 6 months. Industry analysts have foreseen this announcement coming, especially since Boeing earlier had to postpone the first flight tests of the 787 by two months, which would have caused a very ambitious and extremely tight flight test schedule. That news were communicated early September, two months after the ceremonial rollout of the first aircraft. The first flight was originally planned for September 2007, then it was delayed to late November or December 2007 (due to software problems and shortage of bolts), and now the company says, the first flight has been pushed back to the end of the first quarter in 2008. That alone represents a 6 months delay in the program, but with the new first delivery date, it looks like the original test schedule will be in place (actually they have added an extra month to it), and tests will not be rushed through. They now plan for a test period of 8 months, while the flight testing and certification on Boeing’s last new airliner, the 777, took 11 months some years ago. All Nippon Airways (ANA) of Japan, that is the launch customer for the 787 will receive its first aircraft instead of MAY2008, around late November or early December. The delay is a blow to ANA, which was hoping to fly passengers to next summer’s Beijing Olympic Games in the initial planes of its planned 50-strong 787 fleet. By the delay of the first delivery, approximately a further 30-35 787s scheduled for delivery in 2008 will slide into 2009, affecting around 15 customers. However, Boeing expects to have delivered 109 aircraft by the end of 2009, only three fewer than originally contemplated. While calling it “an aggressive plan,” Boeing Commercial Airplanes President and CEO Scott Carson said he “remains confident it is achievable.” Airlines with orders for the first 100 Dreamliners may have problems finding replacement planes while waiting for 787s, but may also be entitled to compensation from Boeing. Qantas for example, one of the world’s largest buyers of the new plane, said Boeing had assured it that the first of the 15 aircraft scheduled for delivery from August 2008 would still arrive within six months of the original delivery date. “Boeing said the August 2008 aircraft would slip, but not by six months. Once that aircraft arrives, the remaining 14 aircraft deliveries will be staggered until December 2009,” Qantas Chief Executive Geoff Dixon said in a statement, which echoes Boeing’s announcement, that they plan to eliminate the backlog in deliveries caused by the shift of the first delivery, by the end of 2009. The delay may be embarrassing for Boeing, as they have repeatedly said they will not follow Airbus in its test and delivery delays connected to the new Airbus A380 superjumbo. Airbus had problems with the wiring of its two floor aircraft, while Boeing is now struggling in the assembly of its first composite airplane. During a webcast yesterday, Carson said the issues driving the decision revolved around “traveled work and parts availability on aircraft number 1. It simply proved to be more difficult than we had anticipated to complete the out-of-sequence work in our Everett factory.” He said the main problems were installing parts of the plane’s structure, which had been thrown out of sequence by some suppliers sending incomplete work to Boeing’s main plant, aggravated by a shortage of some small parts. Flight control software and systems integration activities are not pacing items in the revised schedule for first flight, he added. British Airways has announced today what the airline industry has been looking forward to for a long time: the first orders to replace their long-haul fleet. BA that has been using Boeing 57 B747-400’s and 43 B777’s and 14 B767-300’s for long-haul travels, have decided to place firm orders for 12 Airbus A380 superjumbos and 24 Boeing 787 Dreamliners to replace 34 of their older planes (20 B747 jumbojets and all 14 B767-300’s). This also means an increase of 2 planes in the fleet. The order includes options for a further 7 A380’s and 18 B787’s. BA Chief Executive Willie Walsh told reporters the airline would use the A380 superjumbo to make best use of its limited take-off slots at London’s crowded Heathrow Airport and will be the first long-haul Airbus BA would ever use. It will fly on routes from London to Hong Kong, Singapore, South Africa (Johannesburg) and the west coast of the United States (Los Angeles and San Francicso) and possibly to Indian destinations as well. The 24 mid-sized 787 Dreamliners, will be used to open up new routes and increase the frequency of flights on existing ones. The two types of new aircraft will be delivered between 2010 and 2014, with the first 787 joining the fleet in 2010 and the firs A380 in 2012. He denied the company had experienced political pressure to buy the superjumbo, the wings and engines of which will be built in Britain. “There was absolutely none,” he told reporters. “There was no contact, be it formal or informal. The decision was made in the best interest of British Airways. In the engines, the choice of Rolls-Royce was because British is best.” He also added that environmental concerns were a critical consideration: “These aircraft set the gold standard when it comes to environmental performance. . .[and] will contribute significantly to our target of improving fuel efficiency by 25% between 2005 and 2025.” BA took delivery of its first B747 jumbo on April 22, 1970, becoming just the fifth airline to get one and had used all types of the largest Boeing aircraft. That tradition will be broken now, as even though the new B747-8 is out on the market (and Lufthansa has ordered a few pieces of it as well), BA chose the A380. BA said it was considering aircraft to replace a further 37 Boeing 747s and is examining the Boeing 777-300 ER, the Airbus A350XWB, as well as a stretched version of Boeing’s 787, the 787-10, which the planemaker has yet to launch to replace the remaining 747-400s. A follow-up order should not be expected before 2010 according to BA.